Good! This project has few (if any) benefits. This same amount of money could be put towards local matching fund for SAS Phase 2. That would be a much better use of that money. Or put it towards doing Triboro RX. Well, if Amazon wants to spend its own money on this streetcar - and not expect “Amazon” Cuomo or “Amazon” de Blasio to spend taxpayer money - then I might be okay with that. Who needs a well thought out, transportation solution when you got a hippy expensive streetcar that makes politicians and economic development companies egos bigger? Apologies for bumping this thread but I’d like to share my thoughts on the BQX project (again). • $7.2 Million is a waste for a Streetcar that has been Shortened. We know that. • That Money can be better allocated on other projects that would prove to be more productive. • I’m not sure if this is a fact or if it’s just me, but I feel like the city has some weird obsession with the Brooklyn Queens Waterfront. I would understand why because of how appealing it is and the (potential) development that it has, not to mention money. • The BQX is a waste. We have the train, which somewhat parallels the BQX. We also have the Q69/Q100 LTD, The B32/B62 and the B61/B57. • The most obvious one is to make upgrades along the line. Extending it to at least 480’ in Train length. Increased service/ Reduced Headway’s. ADA accessibility along all stops. Etc. • We can also consider the option of adding bus lanes along 21st Street along with Extending the Q69 down to Greenpoint Avenue/Kent Street via 44th Drive and 11th Street/McGuiness Blvd. May not be as effective, but it could give Astoria/LIC Riders along 21st Street more options, as well as serving as an alternative to the north of Greenpoint Avenue. I propose this because I have some criticism against @RR503‘s Train extension. Which I’ll elaborate on in a different post. • The last Alternative would be some tweaks in Brooklyn Bus Service. Examples would include some service increases or potential reroutes in B32, B57, B61, and B62 Service. Maybe even a revival of B71 service. I won’t go in depth with this because I don’t know the Brooklyn Bus Network that well. Maybe any Brooklynites (or any former Brooklynites on here) can shed more light on this topic. I'm so used to hearing about this, so I'm going to play devil's advocate for a bit. We're always thinking of plans that we never actually build because they aren't necessary for the time period. Look at the Northern Blvd line. The growth in that area on the was unprecedented, and yet while we never actually thought of building a parallel line back in the 1900s we do today because of the congestion in that area. Now, similarly, the BQX's demographics are prone to change, and perhaps the number of daily riders while increase exponentially like it did on the or the , say we're going to have some golden economic opportunities along the East River waterfront that we never even thought of (like Amazon HQ2 that happened recently, although that idea is gone now). In that case, we'll be wishing that we actually did build a BQX, all those years ago. But don't get me wrong here. I'm pissed as well that we're spending money unnecessarily on a line that already parallels the , doesn't do much for Manhattan, has been shortened and simplified yet somehow costs more money, and has a cost that does not justify its current ridership. All I'm saying is that things have the potential to change. That Northern Blvd line would be a godsend for line riders, that’s for sure. It was needed decades ago. Flushing, Corona, East Elmhurst and Jackson Heights developed so rapidly after the Roosevelt Avenue line opened. It’s kind of surprising the City-operated IND did not make it more of a priority, unlike the IND-built lines in Upper Manhattan (today, the ) and the Bronx (today, the ) literally blocks away from the existing IRT lines (today, the and lines). Those IRT lines were privately operated, and the City under Mayor Hylan wanted to put them along with the BMT (his former employer) out of business. But a big difference between the and the is that the areas near the grew so rapidly, continue to grow today, and crowd the line at all hours of the day. The is underutilized. trains may be crowded, but they’re also only four cars long. Make them eight cars long with the current R68 stock (or ten 60-foot cars) and they’re likely to be less crowded. That’s one reason I’m not a fan of building BQX. If the were bursting at the seams like the , the Lex and the QBL, then I might be more open to doing BQX. 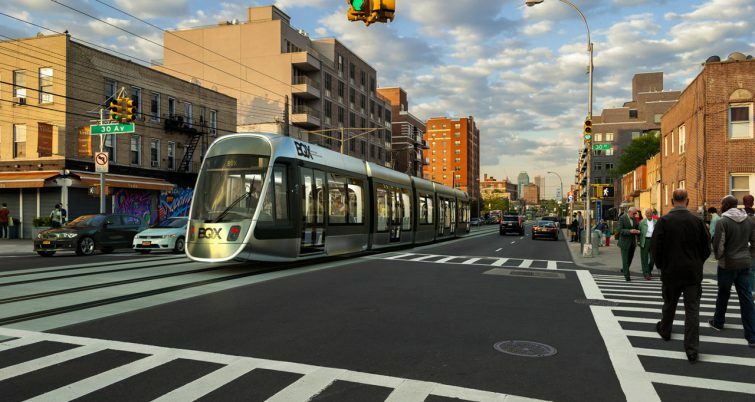 If the middle of the BQX wasn’t the one section of the proposed line that’s actually some distance from the (which goes well inland from Bed Stuy to Fort Greene), then I’d suggest the possibility of an isolated as a light rail line, possibly as the foundation of a Brooklyn-Queens light rail/streetcar system. Glad you asked. The City haven’t allocated any money towards BQX yet (wonder if they ever will). I certainly would be open towards them putting said money towards relief for the existing lines. Or as a “down payment” on a Utica Avenue subway extension. De Blasio really seemed to be talking that one up for a while...what happened with that? You kind of answered your own quandary there. With the exception of Queens Blvd and the Crosstown, everything the IND built was intended to replace privately run operations by the IRT and/or BMT. By the time they actually got what they wanted, the collapse of the private railroads, the IND and its successors were flat broke. It would've been much better had the IND actually worked with the other railroads to give New Yorkers a more comprehensive transit network, but sadly, that was not the case.